Helps to turn your fastest laps. Predictable grip inspires confidence and helps lower your lap times. Predictable grip character that's easy to drive at the limit, and confidence inspiring for the quickest lap times in amateur road race competition. Can be used at different wheel postions and rotated in both directions, to maximize tread life for the most possible laps at the race track. Minimal break-in required. Molded to 4/32nds of an inch tread depth. No shaving required. Split second steering response and precise turn-in enable precision at the track. 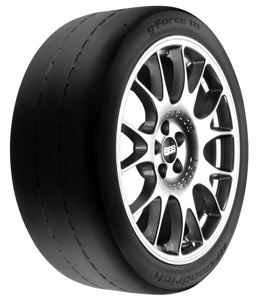 The g-Force R1 tread compound offers quick warm-up, superior cornering power and consistent grip lap after lap.